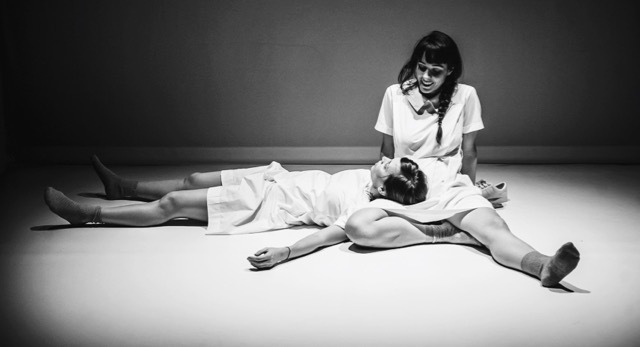 Founded in 2007 by Montreal-based artist Priscilla Guy, Mandoline Hybride explores the body in motion through different medias: Videodances, site specific choreographies, video installations, and multidisciplinary stage performances. Everyday architecture, nature and gestures, as well as choreographic editing are at the center of Priscilla Guy’s creative approach. Mandoline Hybride has presented works in more than 15 cities in Quebec and Canada, as well as in the United States, France, and Spain, in addition to several international festivals where Priscilla Guy’s films were screened. Mandoline Hybride has developed a specialized expertize in screendance since 2012, notably through the Regards Hybrides’ platform, cofounded by Priscilla Guy and Claudia Hébert (Toronto, Canada), dedicated to dance on screen and its articulation, development, and influence. During its 5th anniversary celebration in 2012, Mandoline Hybride received the Prix Culture from LOJIQ for its performances of MOVING INSTALLATIONS in Paris and Saint-Malo (France). In 2014, Mandoline Hybride was given the «Most Innovative Use of Sound/Music» award at LightMoves Festival of Screendance (Ireland) for its film CORRIDORS. Originally from Sherbrooke (Canada), Priscilla Guy is a multidisciplinary artist who has been based in Montreal since 2005. She holds a BFA in visual arts (Concordia University, Montreal, Canada) and an MA in contemporary dance (York University, Toronto, Canada). She is primarily interested in everyday gestures, and transforming the objects and architectures that surround her through pedestrian movement in order to reveal the poetic and politic discourse they embody. Priscilla Guy participates in the development of crossings between movement and cinema as a curator for screenings, a conference speaker, a cultural mediator and a screendance artists. She collaborates with international experts on several academic publications on screendance, notably for The Oxford Handbook of Screendance Studies (New York, USA), The International Journal of Screendance (Wisconsin, USA), La creación híbrida en videodanza (Mexico), The Dance Current, and CINE TFO (Toronto, Canada). She is now a PhD candidate in cinema at Université de Lille 3, in France. Priscilla has been the director of communications at theatre La Chapelle Scènes Contemporaines in Montreal between 2014 and 2016. She has sat on the evaluation committee of the dance section of Montreal art council from 2013 to 2015, and has also been a member of La danse sur les routes du Québec’s Board of directors from 2011 to 2015.